← Features: How to use...? 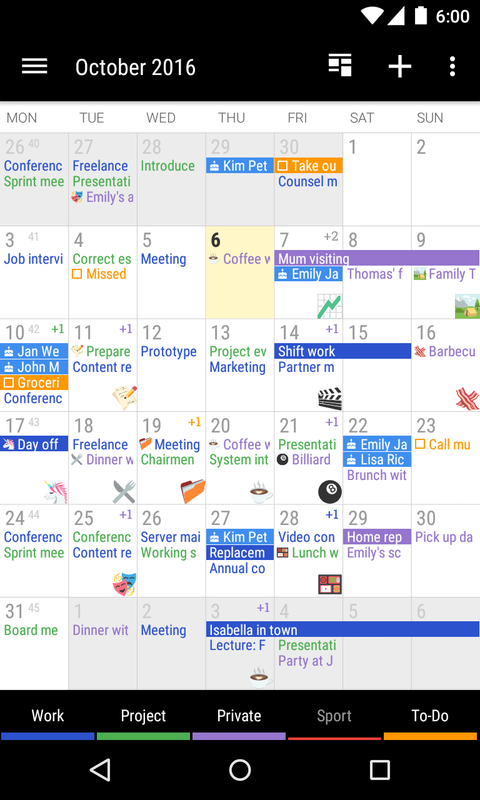 Business Calendar 2 gives you the possibility to distinguish your events/tasks with different emoticons. 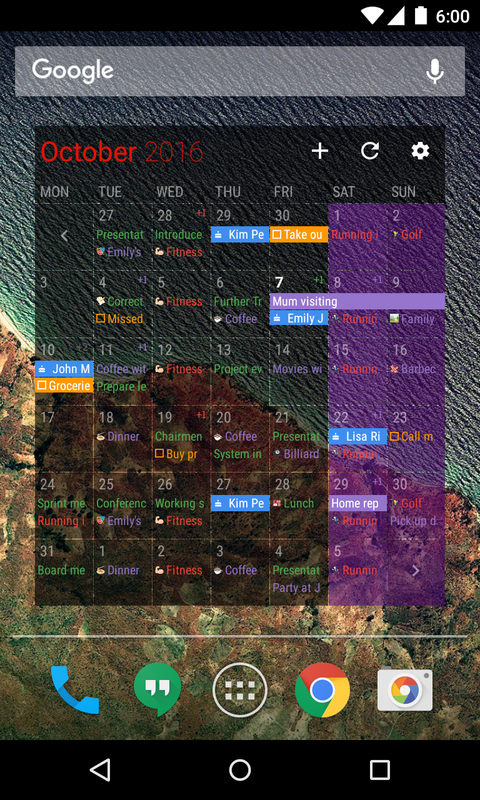 This way your can personalize your events/tasks even more. From now on it will just take a glimpse to tell your appointments apart. How do I activate the emoticons? and you click on the → Appearance there. 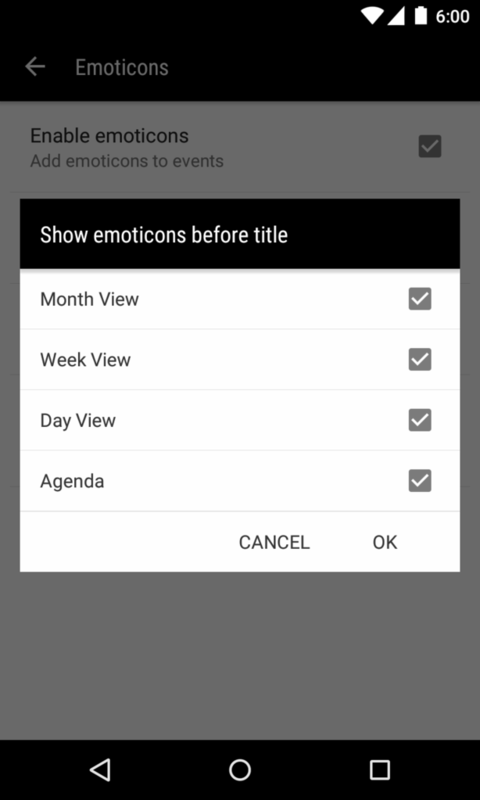 and check the → Enable emoticons box. 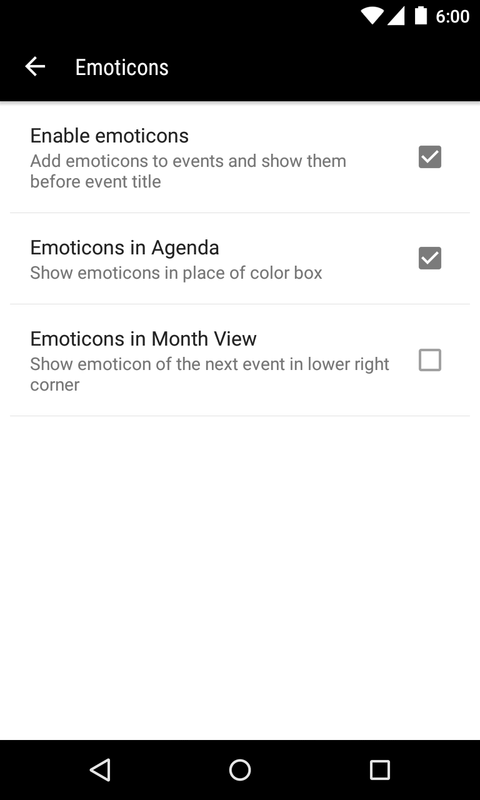 By doing so, you will activate the function to add emojis to your events. 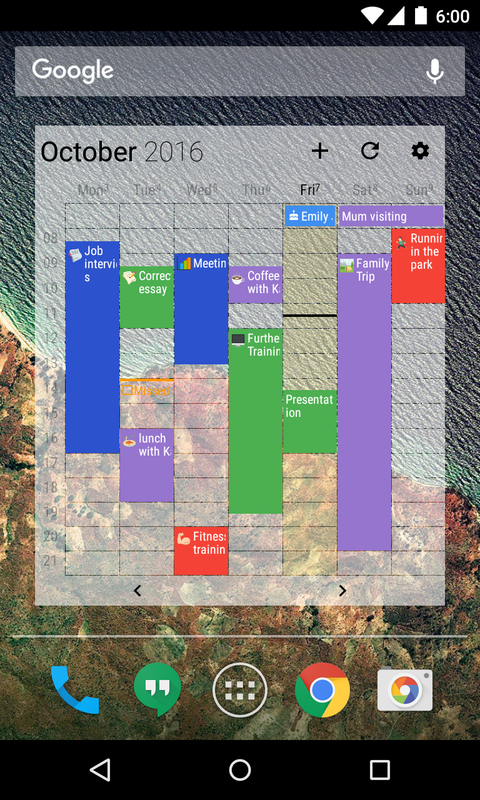 You will be able to see them in front of the event title in 5 calendar views: Month, Week, Day, Agenda and Tasks. 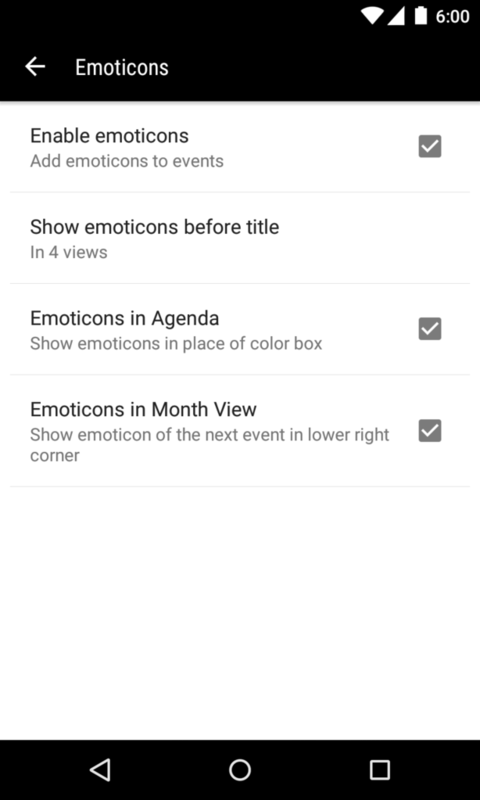 If you, however, want to see the icons in a particular view, you need to select the option → Show emoticons before title and choose the view(s) you want to see your icons in. Hint 1: If you want to add the icons to your events, but view them only in widget, you will need to activate the mode and change the setting to →show emoticons before title to → In 0 views ( i.e. deselect all of the options). This way you will be able to add icons to the new events, but they will not be visible there. 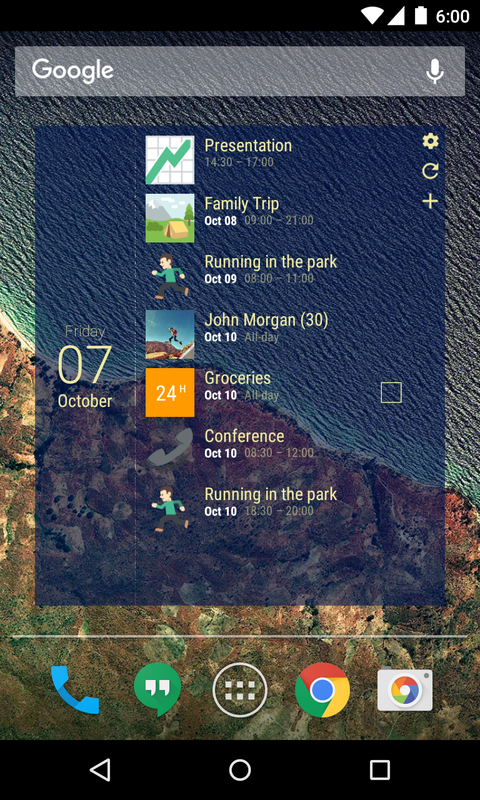 Hint 2: Please note, that the icons can be exclusively added to your events and tasks. It is not possible to add them to birthdays. 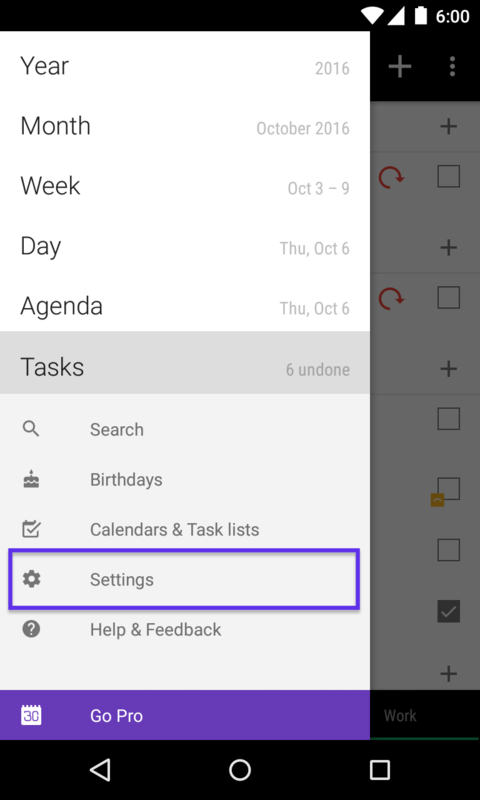 When creating an event/task, you open the input mask in order to introduce relevant data to your event. 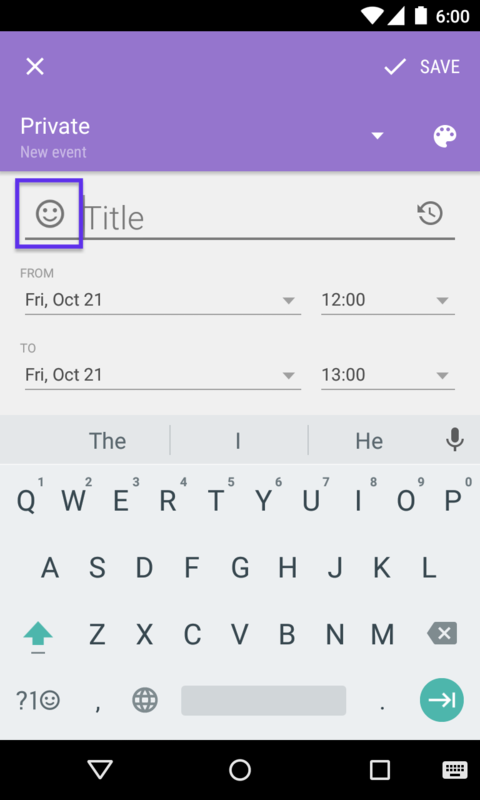 There - next to the title - you will spot the emoticon icon, which opens the emoticon preview. 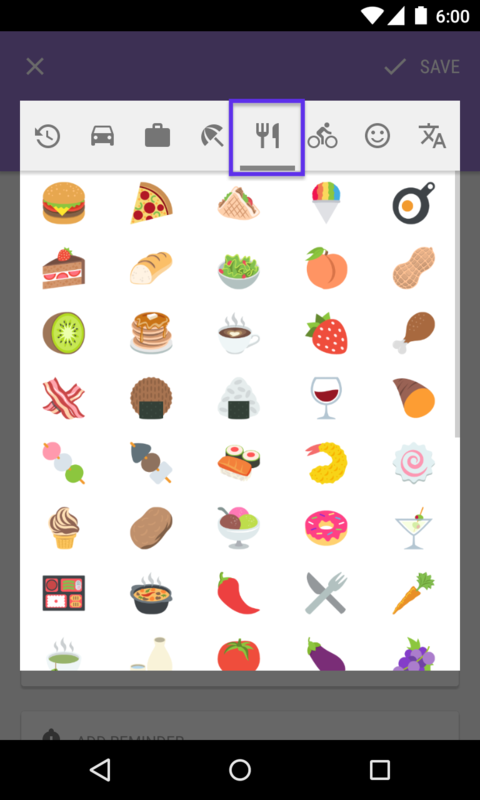 The emoticons are categorized thematically and you can access a single category by clicking a corresponding tab. All you need to do is to choose one icon, which depicts the event most appropriately, by simply click on it. 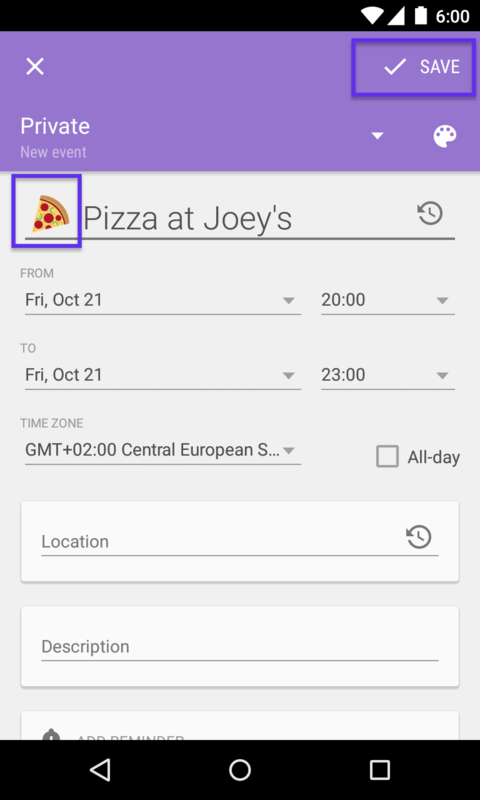 Then you may add other necessary information to your event and save the changes. Where else can I see the emoticons in the app? 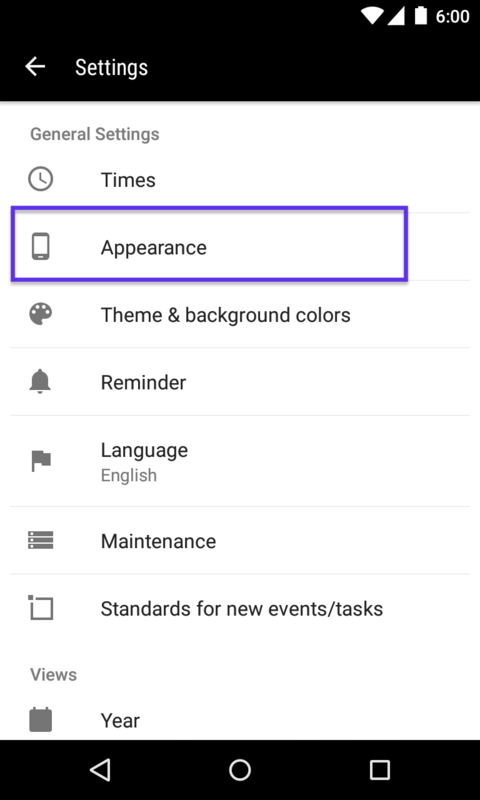 Apart from the option to display icons before the event title, there are two more settings, which will either enable you to see icons in the place of the color box in Agenda or to see the magnified icons of the next available event in the lower right corner of the Month View. Please, note that the icon shown on the today’s date will demonstrate the next event of the day (so if the next event doesn’t have the icon, there will also be none in the lower right corner). The future dates will show the first event of the day with an icon. The icons in the past are turned off per default. 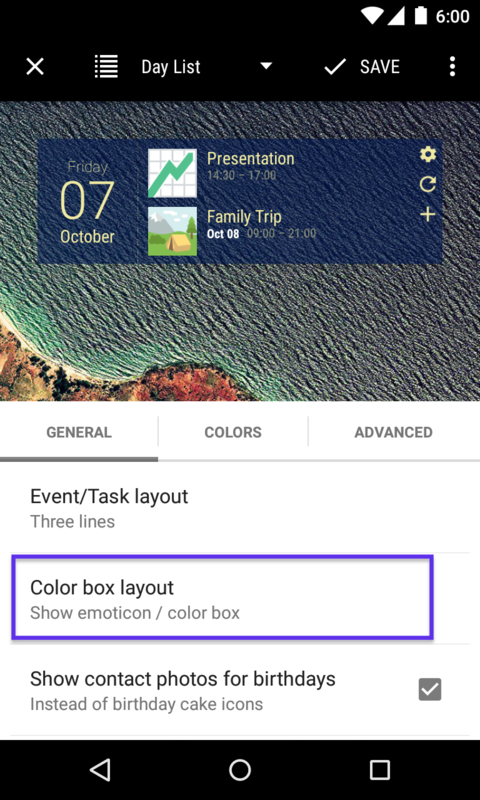 Can I see emoticons in my widgets? 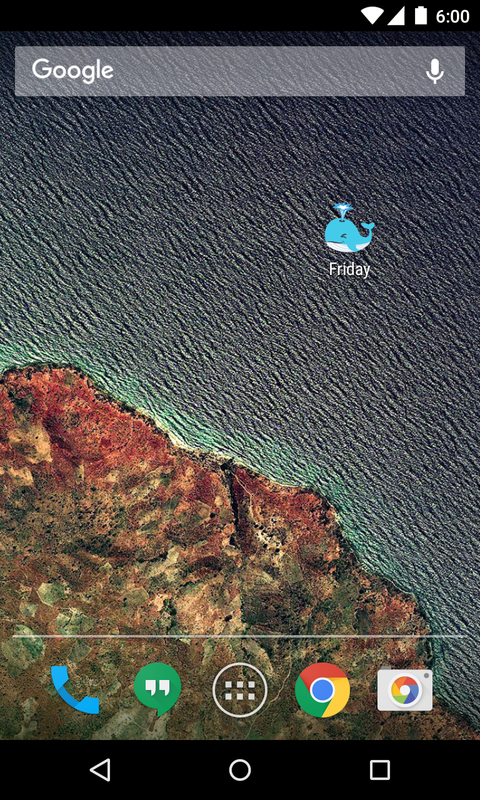 It is also possible to add emoticons to your widgets. 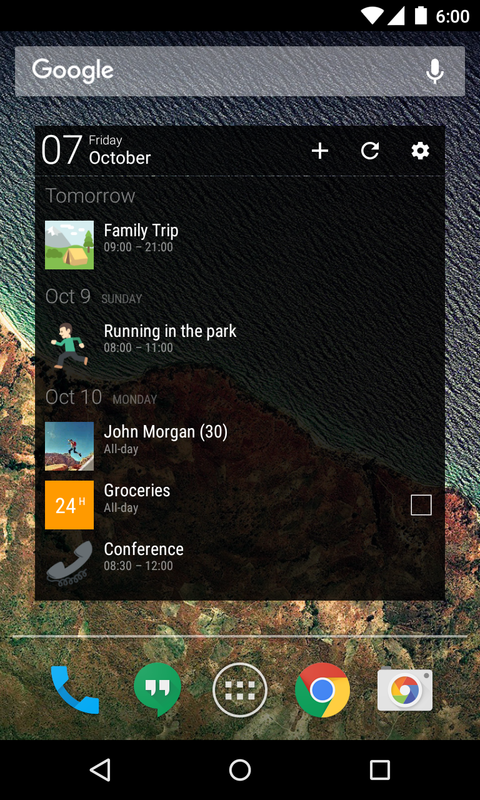 All you need do to is to activate them for a widget of your choice. 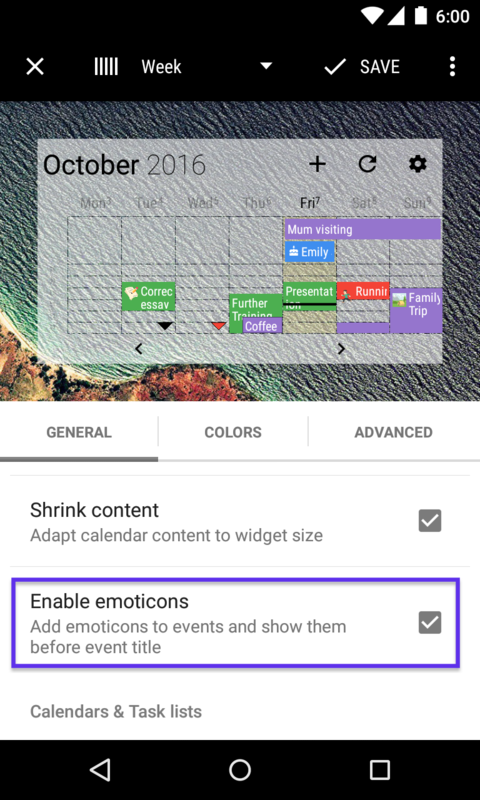 In the → Month Widget, you activate it in the → General Settings by checking the → Enable emoticons box. 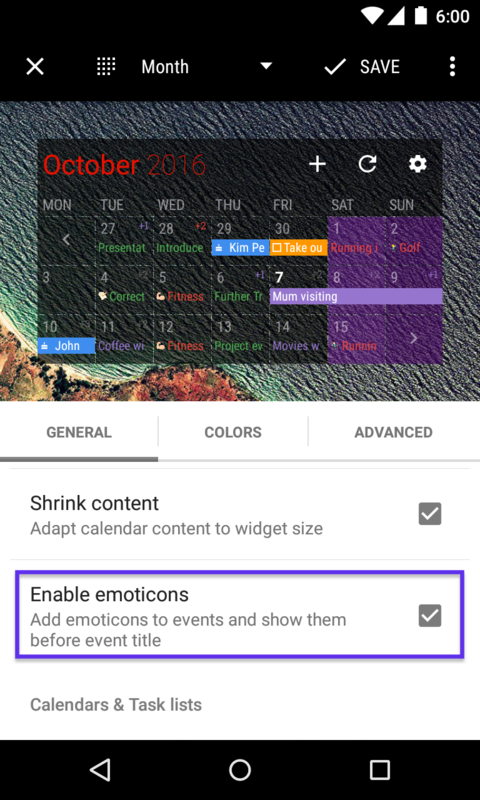 In the → Week Widget, you also activate it in the → General Settings by checking the → Enable emoticons box. 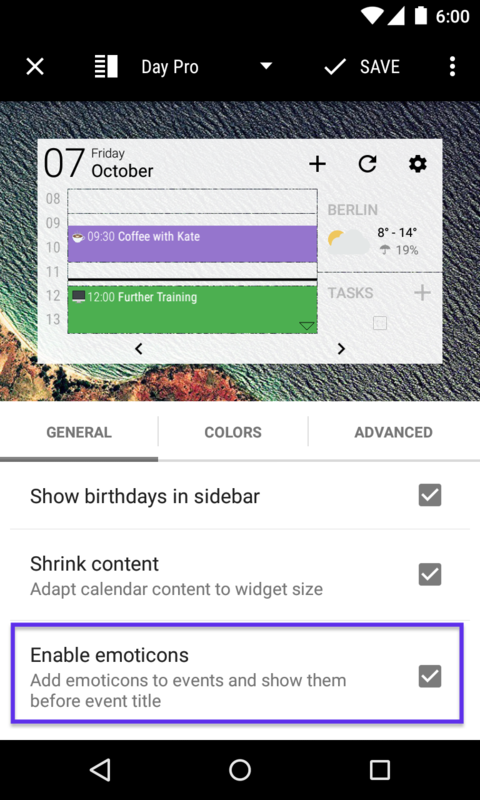 In the → Day List Widget, you go to → General Settings and click on the → Color Box Layout. There you choose the → Show emoticon / color box option. 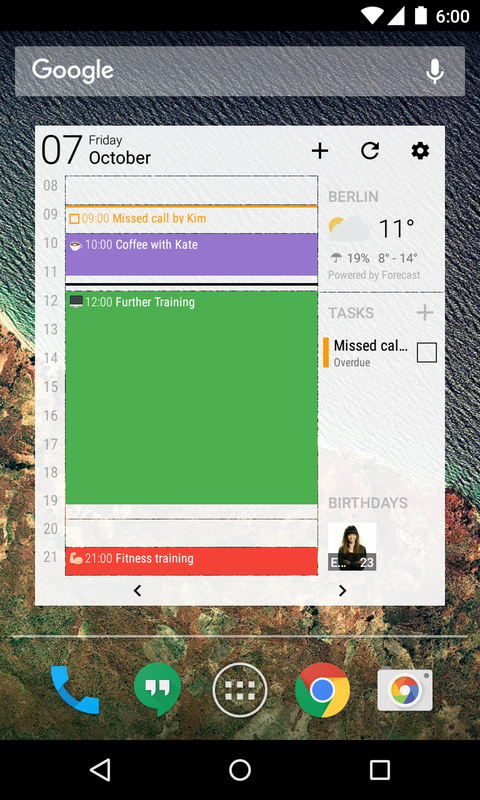 In the → Agenda Widget, you do the same. 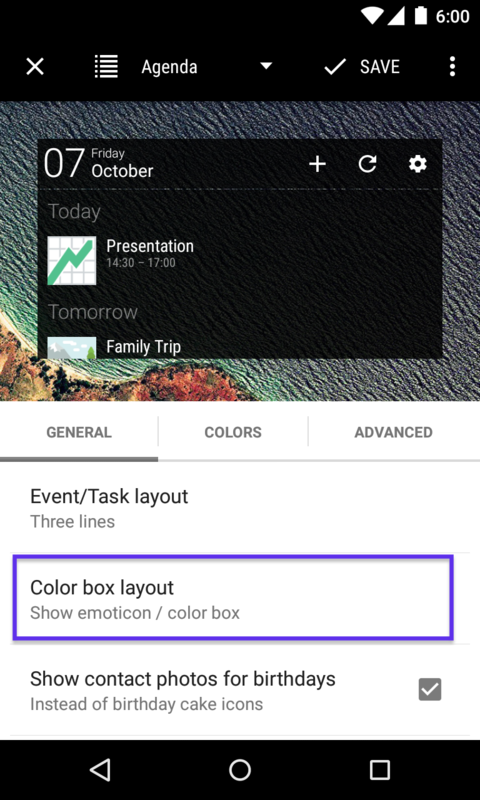 In the → General Settings you click on the → Color Box Layout and you choose the → Show emoticon / color box option. The → Icon Widget gives you also the possibility to see emoticons. 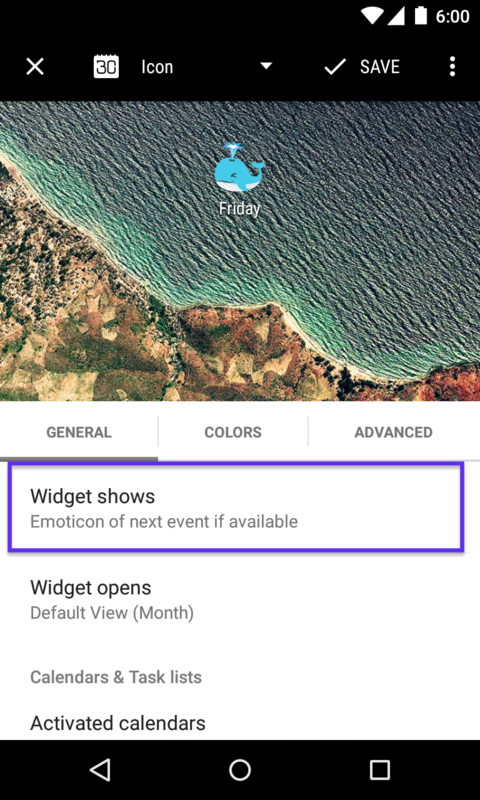 The widget can depict the emoticon of the next event if such is available. 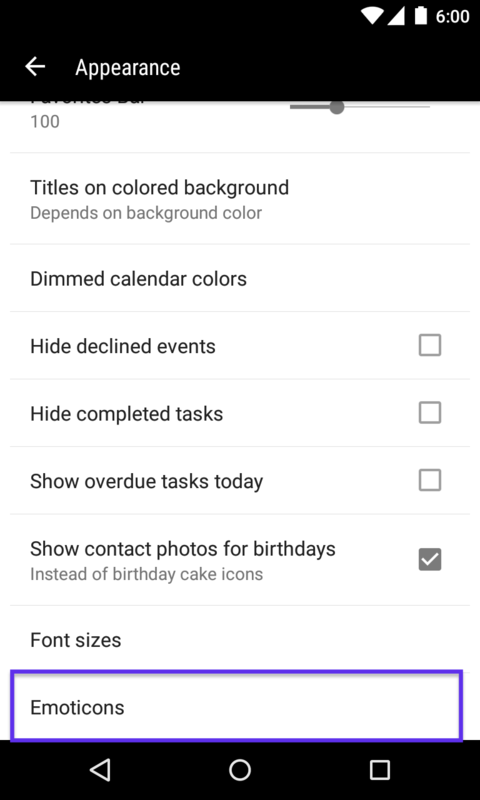 To enable the option open → General Widget Settings and click on the → Widget shows option. In the list you choose → Emoticon of next event if available. 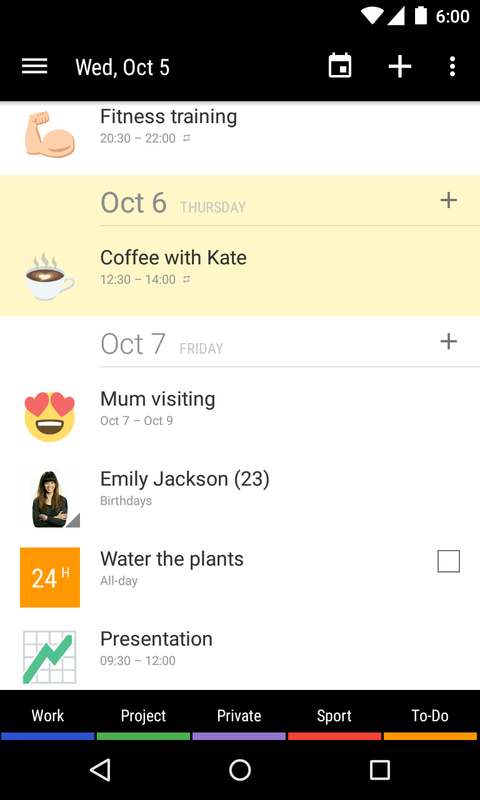 In the → Day Pro Widget, you activate it in the → General Settings by checking the → Enable emoticons box.